A pretty solid initial premise only gets this movie so far, as it really loses steam and energy for a good portion in the middle of the film. Mud is an okay movie. It’s s film that was made with a pretty interesting starting point and ending point, but just not a whole lot in between. This is the kind if movie that might have worked better as a short film or short story. You can feel how much the mud-section (ahem, mid-section) is stretched out. We have the story of a man who is being hunted for setting he did. At the beginning two boys meet him in the place where he is in hiding. At the end the hunters and him have a showdown. In between is really just a lot of filler. 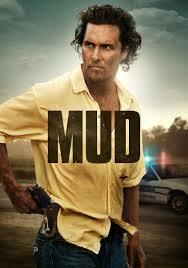 Mud seems like it would be a good movie based on the cast involved and the basic premise. Unfortunately that premise is only enough to kick start the film, and hardly enough to keep the momentum going for very long. 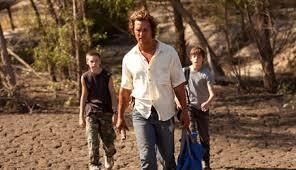 This is the independent movie that started off Matthew Mcconaghey on his biggest year of acting yet. It was the year of his amazing turn in the HBO show True Detective, and also the same year that he won an Oscar for Dallas Buyer’s Club. He went on from there to star in Interstellar, the movie Christopher Nolan followed up his Dark Knight trilogy with. All of this was great. All of it, except for Mud. The film has a very simple storyline, and that’s nice at the beginning, but it really needed to expand after that. The premise has two boys steal a boat and take it out to an island. We don’t know much about the boys at the start of the film, other than that they are being sneaky and doing something that they shouldn’t be doing. The boys are Ellis (Tye Sheridan, who is quickly becoming a young star with turns in Joe and now the new X-Men movie, X-Men Appocalypse.) Both boys seem equally rebellious, and it’s hard to get a read on them at that start. Then the boys get there, wander into the woods on the island, and find a boat stuck in a tree. They climb the tree and are thrilled with their discovery, claiming the boat as their own sort of hideout – treehouse. Then the boys start snooping around the boat and finding things, leading them to believe that someone is living there. They quickly climb down and head to the beach. Once on the beach, they find the man who is living in the boat. This is Mud (Mcconaghey,) and he claims to have a problem that he needs the boys to help him with. He has a girlfriend named Juniper (Reese Witherspoon,) who he sis supposedly meeting soon, on the island. Until then he is waiting out for her, here. Only he does not have food or supplies. He can’t go riding into town to get those things, because there are men out that way who are trying to kill him. Mud tells the boys a story about how he saw a man hurtung Juniper once, and Mud intervened. He ended up fighting with and killing this man. Now it’s the father and brother of this man who are looking to avenge that death, and have ridden into town in search of Mud. This whole thing sounds like a western, and it very well could have been one, with a plot like this. In many ways it reminds me of High Noon with its waiting in a secluded area stroyline, knowing that the enemy will be arriving by the end of the film. In that movie, Gary Cooper also waited around in a quiet town, knowing that the enemy would be arriving at noon to try and kill him. Here in Mud, we know the showdown is coming, but we hope for something a little more than that. Some kind of twist that can spin the plot in a whole different unpredictable direction. That twist never comes. The boys leave Mud on the island and make the decision to start helping him out. They take the boat back to the island and start gathering supplies to bring to Mud. He has arranged a deal with that, whereif they continue to bring him the items he is requesting, he will give them the boat when he’s ready to leave. It’s Neck Bone in particular who is interested in this. He’s the guy, between the two friend, who is always looking to prosper and make deals. When the boat doesn’t work out, Neckbone makes another deal in order to obtain Mud’s pistol. Aside from the storyline about brining objects to Mud, there’s also a divorce going on with the parents of Ellis. Both parents are pretty civil to each other, but the mother (played by American Horror Storie’s Sarah Paulson,) just didn’t see herself ending up here. She loves the father and her son, but never thought she’d be spending her days living out on a houseboat, and now decides its time to move on with her life. Ellis’ father takes this personaly and confides in Ellis about it. Ellis also has a problem with a girl that he is interested in. She won’t give him the time of day. Everything starts out fine, with Ellis punching out the much older guy who is messing with her. That’s what brings his attention to this girl. They talk and he gets her number. Only the next time he sees her and she’s walking around with a bunch of friends, he call to her and she ignores him. Only Ellis isn’t the kind of guy who doesn’t give up so easily. He continues to pursue the girl and punches the next guy, who she is seeing, in the face as well. Only this guy isn’t taking it. He gets up ans starts wailing on Ellis. The girl who Ellis is pursuing is a good deal older than him (close to a decade,) and so it’s hard to believe that Ellis thinks he can be with her, to begin with. Meanwhile, Ellis and Neckbone find Juniper and witness her making out at a bar with another man. This is the love of Mud’s life, and she gives up on him pretty easily. Up until now, Mud and Neckbone have been getting Mud both information and supplies. There is a whole team of bounty hunters in town, searching for him, and only Ellis and Neckbone actually know where he is. By the end of the movie, the bounty hunters finally close in. This brings us to our climax where Mud has to stand up to them. It’s a pretty cool scene, of him moving around the house boat, looking for his enemies, and the only real problem With it is that its too llittle too late. If there were other scenes in the movie like this, with some excitement to them, this would have been a much better film. As it is, the movie reminds me of a film called Killing ‘Em Softly,” from about two years ago. That movie was fine and well-made, but when it came for the story, it was all things that we have seen before. Same thing here. There’s very little fresh or original.